Beauty is revealed at Ambassador Villas where luxurious North Myrtle Beach condominiums welcome your family to a remarkable North Myrtle Beach vacation. This North Myrtle Beach resort is on the oceanfront and features North Myrtle Beach rentals with ocean views. These spacious condominiums in North Myrtle Beach, SC accommodate large numbers of people so you can bring extended family and friends to North Myrtle Beach, SC with you. Ambassador Villas is a charming North Myrtle Beach resort with beautiful landscaping. Palm trees on the oceanfront and a wooden boardwalk to the white sandy beaches add to the terrific tropical flavor of this North Myrtle Beach resort. To get to the beach from the comfort of your private North Myrtle Beach condo rental is a breeze. This oceanfront resort is on stilts so you must take the stair down a flight or two and then follow the path over the dune line and out to the shoreline. Spend the whole day basking in the North Myrtle Beach sunshine. Lounge on a beach towel or in a beach chair and read while you get a suntan. Take a nap or watch the kids play in the Atlantic Ocean. Jumping waves, walking to the sandbar during low tide and building sand castles are all part of the fun during a North Myrtle Beach vacation at Ambassador Villas. 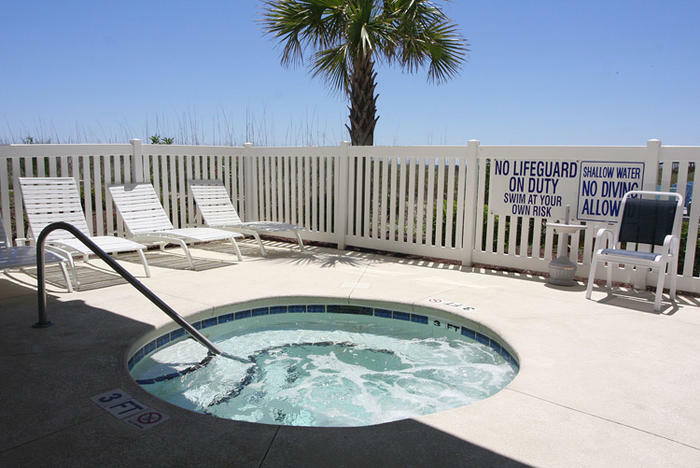 You will find a partially covered swimming pool and a partially covered hot tub on the sun deck at this North Myrtle Beach resort. Slip into the blue pool for a refreshing dip and sink into the hot tub for a rejuvenating soak where bubbles and jets massage your body from head to toe. That is what North Myrtle Beach vacations are all about. The large North Myrtle Beach condominiums at Ambassador Villas may feature seven bedrooms and as many as six full baths. They are beautifully furnished with fabulously comfortable furniture.